1057. 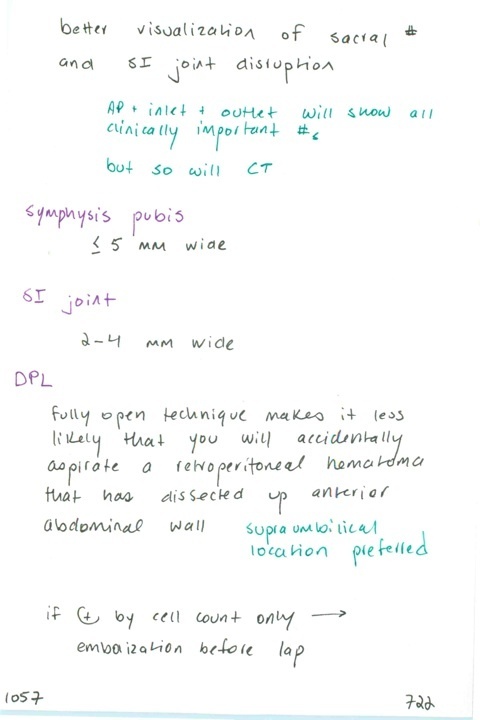 Value of inlet/outlet pelvic radiographs / Normal width of symphysis pubis & SI joint / If doing DPL in context of pelvic fracture, why do a fully open technique? / Unstable blunt trauma patient with pelvic # and DPL positive by cell count only: OR or angio? Previous PostPrevious 1056. Pelvic trauma + blood at the meatus = what? / Gross hematuria = what? // S2-S5 nerve root injury signs and symptoms // AP compression fractures of the pelvis are strongly associated with what thoracic injury?